If you don’t have a content marketing strategy, you don’t have an online marketing strategy. I’ve been saying that for some time now, and I think it’s never been more true than it is today. If you want to succeed online in any industry that’s even remotely competitive, you must have an effective content marketing strategy. I’ll explain that more in a moment, but the key point is this: Static, rarely-updated, brochure-ware websites are dead. I think they’ve been dead for some time now, but Google really put the final nail in the coffin with its latest algorithm change that emphasizes the value of (and the need for) fresh content. Earlier this month, Google made a huge announcement that I think probably hasn’t been written about enough. (Certainly not by me; I’ve been trying to write this post for weeks now.) Search results “are best when they’re fresh,” Google said in its announcement. “Even if you don’t specify it in your search, you probably want search results that are relevant and recent,” Google’s Amit Singhal wrote. To be clear, this isn’t going to impact all small businesses in all industries in every location. In fact, I’d guess that purely local businesses might not be affected at all — searches like “seattle bakery” or “kansas city dry cleaners” probably aren’t the types of searches where fresh content is necessary. But Singhal said this is a ranking change that affects at least one result on about 35% of all searches, and clarified to say that about 6-10% of searches would be changed “noticeably.” That’s huge. As I said above, I don’t think a bakery in Seattle is going to be impacted by this too dramatically. How often is there breaking bakery news? In Seattle? But there are millions of small businesses that aren’t doing business just in their immediate local area. And millions more that are operating in industries where there is regular news or where things change on a regular basis. In those cases, Google is saying it will reward quality websites that offer fresh content. 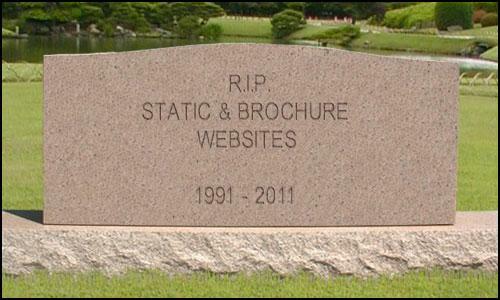 If that describes your small business, your static and never-updated website is officially dead. In many industries, I believe it will be nearly impossible to get natural search visibility in Google with a small, brochure-style website that doesn’t offer fresh content. As I said at the beginning of this article, if you don’t have a content marketing strategy, you don’t have an online marketing strategy. So it’s time to develop a content marketing strategy. And keep in mind that this content has to exist on your website; using Facebook and Twitter are fine, but that’s not where your content strategy lives. It has to live on your website. Get your team together and discuss the pros and cons of starting a company blog. Cons: Blogging isn’t easy, not if you plan to do it the right way. More and more business are blogging, but many will get it wrong. Don’t be one of them. Pros: When done right, blogging can mean more search traffic and more inbound links. A great blog can be the best weapon in your SEO holster. Before you launch your blog, create an editorial calendar. You’ll use this to guide what articles you’ll write, who’ll write them, and when they’ll be published. Be sure to read my article, A Simple Sample Editorial Calendar to Keep Your Blogging on Schedule, for more guidance in this area. Write a lot before your blog launches. Before you even add the blog to your website, have the first month or two of articles already written — or at least as many of them as you can. Writing material in advance will help with making the launch smooth; you won’t be desperate for article ideas, nor will you be hurt if someone misses an assignment. Know where to watch for new blog content ideas. I’m sorry, but I have a hard time accepting it when I hear bloggers say they can’t find anything to write about. I wrote a series with all kinds of tips for this: 5 Ways To Find New Blog Content. Oh, and when you’re writing, don’t worry about how long your blog posts should be. Know your ultimate goals and be able to track what you’re doing. If you’re already using a web analytics program, it should be easy to tie your blogging in with existing company business goals. Those goals should have something to do with selling products and/or generating leads — whatever helps your bottom line. Don’t worry about less important numbers like how many RSS subscribers you have, how many times your articles are retweeted, etc. Those things are nice, but getting a hundred retweets isn’t going to help you meet payroll next month. One last thing: It’s okay to choose NOT to start a blog now. If you’re not ready to make the commitment, that’s fine. But keep in mind, you still need to have some kind of plan to consistently expand your website with quality content. Can you start a weekly newsletter and put it online? Can you create a Glossary or a Frequently Asked Questions page and expand it regularly? Matt, nice article, but frankly, I do believe you’re jumping the gun a little on this one. In other words: Google will do its best to separate valuable, evergreen content, from content that is news-related (and therefor time-bound). Rene – thx for your comment. I think if you look up at the text of my article, I do say that there are many types of small businesses that are unlikely to be affected by this, which I think echoes the Google quote that you shared. Good stuff Matt. And I like the new look of your site! I’ve been trying to put up new blog content 2x/week, but my biggest stumbling block is trying to figure out how to get it out there. Other than facebook, twitter, etc. (and being on the year-long Technorati waiting list), do you have any recommendations on where to list a blog so it’s actually seen? I had a similar question about getting my content out there. I just started my company blog last week. I really like this post on SEER Interactive’s Blog about guest posting on other blogs that have followers/readers that would enjoy your content as well. There is a really cool tip on using Google reader to alert you about blogs that are looking for guest posts so that you can reach out to them and share your content. If people like what you say they will be visiting your site/blog after reading your guest post. I switched to a WordPress blog recently and am taking old material and serializing it. I guess that is one idea. Here some for the Dentist: history, the tooth, dental instruments for horror movies. Cheers. I’m getting the impression of being herded into Adwords with all these changes. Just sayin’. M2, thanks for the superb post. I will use it as a manifesto and beat my clients over the head with it; many of them are in bad need of a way to crank out free, service-relevant, useful-to-humans content. Great advice, Matt! Glad I’ve shifted to WordPress for easier updating and posting for most of my sites although as someone mentioned above evergreen content might be less affected than news-oriented ones. Pretty cool tombstone image you have there. I totally agree. FAQ pages are great for optimization and they definitely provide additional information in regards to what the person searching may be looking for. I also believe a testimonials page can be great for optimization too, especially when it’s well written and the person giving the testimonial has mentioned the product or service in the testimonial. Blogging can and will take on a life of its own…very good idea to setup all the particulars you outline, especially #2.